Selling raffle tickets is easy for one of the nation's top sales reps. Imagine you’re walking through the mall. Banana Republic is on the left. Crate and Barrel is on the right. In the middle are kiosks. Kiosks are those mini-stores. They are movable carts which never move. Kiosk workers hawk products like Rosetta Stone language training CDs, NeatReceipts for businessmen on-the-go, and bejeweled faux hair clip ponytails to transform any girl into a rock star. To be really good in a kiosk sales job, you’ve got to possess excellent sales skills. This is cold-calling at its worst. Or best, depending on how you feel about direct, hard-core sales. Here’s the scary thought: This job is not much different than selling raffle tickets in your benefit auction. Quickly assess likely buyers in a crowd. Approach target in non-threatening way. Use catchy line to get her attention. Engage target in conversation about wants and needs relative to product. Convince target it’s in her best interest to invest in this “thing” (even though she had no idea what “thing” was 20 seconds ago). Be tenacious enough to try and try again, because many will ignore you as they push past you to seek more interesting things. Imagine how many more THOUSANDS OF DOLLARS you could raise at your benefit auction if your team included the #1-rated kiosk seller in the entire USA. Let me introduce you to her. Her name is Darby. 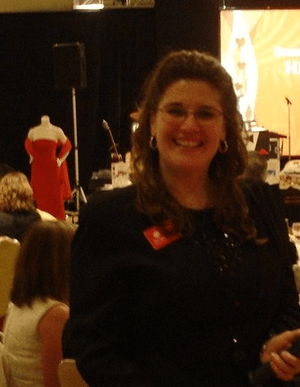 In November 2009, Darby was recognized as the highest earning commissioned retail sales rep in the country, selling Verizon FIOS Residential service from a small kiosk at a big mall near Baltimore. Customer referrals pushed her to be ranked in the top 4 in October and December 2009. And #2 in September. Darby has successfully been a consistent top sales consultant for direct, cold-call sales in the ENTIRE UNITED STATES. And if you’re a Red Apple Auctions client, she might be working at your next gala. Of course, Darby is more than just an outstanding sales rep at your gala. She’s a committed dog owner and has a pet dog she adores. The grungy beast was dodging traffic at a busy intersection when Darby jumped out of her car, pounced on the confused animal, and threw it in her back seat to save it from oncoming traffic. 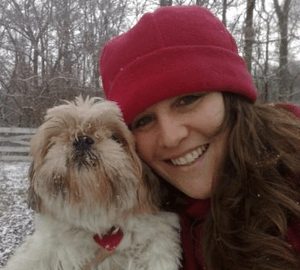 When no one claimed her, Darby gave Poopsie a home. She’s got an old home into which (like all of us with old homes) she’s regularly pouring money. She’s got an interest in acting. In fact, Darby and I met while working on the set of The Washingtonienne (a show which I’m not sureever got off the ground) two years ago. The right person makes the difference, don’t they? 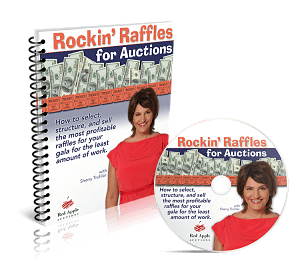 Even if Darby can’t personally work your auction and sell your raffle tickets, I’ve got some help for you that will advance your raffle sales. These are phrases shared by Darby and other staff that they use to open the conversation with guests during the reception. Loved the piece on Darby! Her great energy and warm smile are infectious…no wonder she’s a top sales person. Red Apple Auctions is lucky to have her and so are your clients! Thanks for the comment, Lynn! We all know she’s pretty special, too.